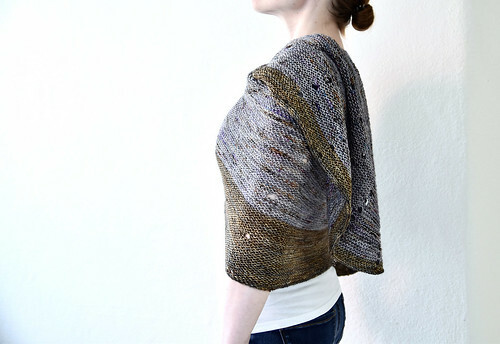 Lately I've found myself more drawn to garter and stockinette stitch instead of traditional lacy shawls. 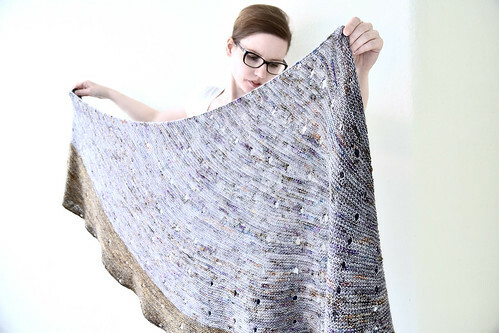 The shape and colors of modern shawl designs seem more interesting than complex stitch patterns, not to mention the more relaxed knitting experience. Probably inspired by the recent Westknits class I took part in, I suddenly felt like knitting Stephen's Dotted Rays pattern. I also couldn't wait to try the new Hedgehog Fibres acquisition, and it was my first time knitting with speckle-dyed yarn. Garter stitch seems like the perfect match for this trendy dyeing technique. The more solid madelinetosh that I'd bought years earlier turned out to be a good match for the speckled yarn. I accidentally went with a larger needle size than planned, so the shawl turned out very drapy and enormous despite leaving out one wedge out of the larger size option. I love the airiness, though, and I think I'll opt for larger needles more often with garter stitch shawls in the future.